Lindsey Graham 2016: South Carolina senator says center-right positions make him ideal 2016 presidential candidate. 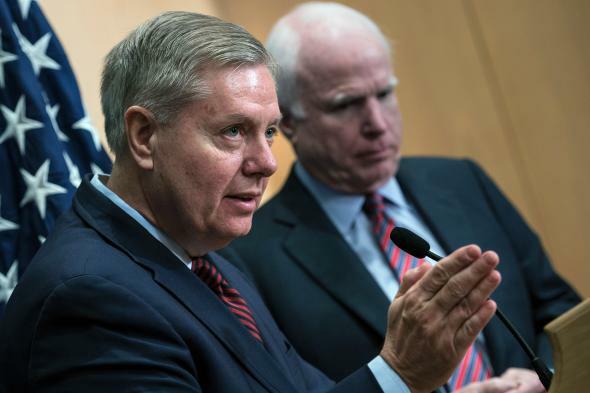 Sen. Lindsey Graham knows where the ditches are and how to avoid them. Politico reports that Graham stressed his work with Democrats, his votes in favor of Barack Obama’s judicial nominees, and his ability to appeal to groups that do not traditionally vote Republican during the announcement. Graham said his next steps are to talk to Republican campaign donors and take polls to test if he has a viable path to the presidency. “My illegitimate son Lindsey Graham is exploring that option,” the two-time presidential candidate said, prompting laughter from reporters during a press conference in the prison at Guantánamo Bay. Politico reports that Graham’s exploratory committee, called “Security Through Strength,” is headed by George W. Bush’s former ambassador to Canada and that Graham plans to make a decision about a potential run by April. The GOP’s 2016 primary field might have suffered the loss of Mitt Romney this week, but it has gained one patriotically-named exploratory committee.